Nearly after a year, the cloudburst on Saturday 8th August proved to be one of worst day in the history of Dharampur and Sandhole. 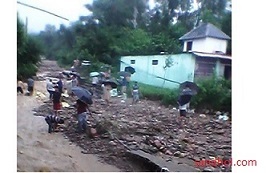 The devastating floods and landslides caused by cloudburst and heavy rain resulted in huge loss of life and property. Three persons were buried alive and many houses & animals were washed away. 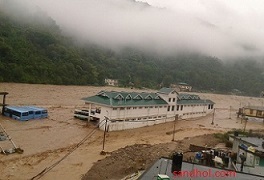 The whole bus stand and buses standing there were submerged in to Son River. This has been second consecutive year and administration has not learnt anything from the past experience. Majority of govt offices are being established on the river beds without make any plan / preparation of adverse situation and Dharampur bus stand was not an exception. Who approves these structures, In Sandhole so called bus stand which is being constructed since long, if it ever get completed, though with pace work in progress, there is a very little hope, is also near the khad. There is need for development but there should be proper norms & plan for rapid urbanisation. There should be policy to channelize river and khad and a monitoring system to stop violations. Since the disaster many govt, political and administrative representatives have visited affected area and have made lots of promises but at ground level much work is required to done. People are not looking for promises but for results. Since the tragedy occurred lots of leaders have visited, to name few – Sh. GS Bali Transport minister, Sh. Anurag Thakur Local MP, Thakur Mahender Singh local MLA, Vikramaditya Singh Youth congress president, Chander Shekhar , local Cong leader, Chairman State Disaster Management Sh Rajender Rana. Visiting affect area and giving statements or sympathising with people wouldn’t work. Your tangible actions on ground level are important. Regarding Administration, they have a policy “Go ahead and leave all unsolved problems” So many complaints are pending with him from the villagers and old ladies but he is sitting on their request. Administration is busy in Mela and other useless activities. So many problems are pending there. Revenue Court has been transferred to Dharampur but SDO is still not working. Revenue Cases are pending for one and half year. We are unable to view Revenue records i.e. copy of Jamabandi and Shajra Nasb at Web-Link of Tehsil Sandhole, District Mandi, all other web links are working. It remains out of order from the last 08 months. People of said tehsil or the one’s residing outside tehsil are deprived to take benefits of this service. We have made so many complaints to D.C on his site and facebook. Result is zero. The monsoon session 2015 of Himachal Assembly begins today, let see all political leaders who have visited Dharapur and made tall promise, what they have to say in assembly. How much grant & help they are going to provide to Sandhole & Dharampur.